Over the past few months the Irish Genealogical Research Society, based in London, England, has put some very useful databases on their website. The most recent addition was a database of 250,000 names taken from their journal the Irish Genealogist (IG). This journal is a treasure trove of decades of genealogy articles of all types: family genealogies; research on the occupations, clothing and customs of our ancestors; and transcriptions from all sorts of family history records, such as parish registers, voter registrations and membership rolls, to name just a few. I recently came across some editions of the IG on the shelves of the Virginia Room at the City of Fairfax library in Fairfax, VA. These journals, from the 1970s, had many articles of interest to those looking for an ancestor’s townland of origin in Ireland. One very interesting article was "The Journal of an Emigrant to Canada." It detailed the diary entries of Thomas Alexander Langford from Laois (also known as Leix and Queen's County) as he traveled to his uncle Isaac in London, Ontario, Canada. He sailed from Liverpool to New York City in December 1853 and then took various modes of transportation up through the state of New York and across the border. 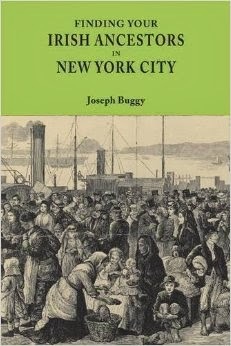 It was a fascinating read and told of the ships journey, being quarantined on Staten Island, his stay in New York City, and his travels northwards. Did he meet his uncle in the end? You'll have to get a copy of the article to find out! Begley, Donal. “The Journal of an Emigrant to Canada.” Irish Genealogist. Vol 6. No. 1. 1974. pp.43-47.